During the Great Depression, the Roosevelt Administration was making a concerted effort to address long-term land use planning while improving farm production. One of the first steps taken was the Agricultural Adjustment Act (AAA) of 1933, an allotment plan to subsidize prices and reduce the disparity between farming costs and income. However, a conflict arose between the crop adjustment programs, which required limited production, and the tendency of the unemployed urban population to return to the land as a means of survival in times of hardship. It became necessary to control this “return migration” in order to stabilize prices, especially in more rural areas. While the government could not prevent citizens from farming the land to survive, the Roosevelt administration instead acted to reduce the amount of excess production, which could drive prices down, in order to stabilize the agricultural economy. The result was the Subsistence Homestead Program. The National Industrial Recovery Act of 1933 established the Subsistence Homestead Program, described as a “back-to-the-farm” movement. Existing farmland was purchased and subdivided into one to five acre farming plots. Low-income families were then relocated to the tracts where they could offset the cost of living by producing their own food. In order to keep production to a minimum on these small farm cooperatives, sites were chosen such that adequate non-farm employment was available nearby and the homesteaders included in this program had to be fit for industrial employment. While part-time farming as an income supplement was not a new idea, the American experience with organized, collective, “garden home” developments were very limited. As a result, the Subsistence Homestead Act became a controlled experiment in land planning, economics, housing design and social structure. Despite critical views that the program’s collective nature was “communistic,” fifty-eight resettlement programs were planned for several areas of the country, ranging from 25 to 300 homesteads per project. Forty-three projects were constructed. Only four of these were in the west: El Monte, California; the California San Fernando Valley; Longview, Washington; and Phoenix, Arizona. In December 1933, Paul V. Fuller was selected to administer the Subsistence Homesteads Program in Arizona. He conducted extensive studies and in March 1934, announced that Arizona’s first homestead site would be in the Salt River Valley, near Phoenix. Four miles northeast of downtown Phoenix, eighty acres known as the Baxter Tract, were purchased and a local corporation, Rural Homes of Arizona, was formed to administer the project and coordinate financing through loans from the federal government. The southern forty acres were developed initially, with forty 3/4-acre plots laid out. Construction began in March 1935, and twenty-five homes were ready for occupancy by October. This first project was typical of the Subsistence Homestead Program. The size of the lots had been carefully analyzed to be capable of producing a large portion of the families’ food without producing surplus; the average family of five supplemented its income with a garden, orchards, chickens and a cow. Participants in the project also had to secure part-time employment in a non-farm capacity. While construction on the Baxter Tract and several similar projects like it across the country was underway, the Roosevelt administration reorganized the various agencies handling the rural resettlement programs into one coordinated program, the Resettlement Administration. The basic tenets of the Subsistence Homestead Project were kept, but modified to emphasize more densely clustered housing and larger blocks of common area farmland. Additionally, a maximum age of 55 was set for participants. By mid 1936, the Resettlement Administration had approved 97 projects nationwide. Three resettlement projects were operating in Arizona by July 1936, including the original Baxter Tract. The other two were Casa Grande Valley Farms, Inc., and Arizona Part Time Farms, Inc. As a result of the improving agricultural economy, these projects were now encouraged to both provide subsistence for those living in the project and operate as commercial enterprises. Housing was designed for multi-family groups and the remaining acreage devoted to cash crops such as cotton or alfalfa. Although the size of each individual home lot decreased, the average acreage increased to five acres per family. Arizona Part Time Farms, Inc. was approved to develop five sites in the Salt River Valley: 210 acres in Chandler, 75 acres at Indian School Road and 28th Street, 80 acres at Northern and 51st Avenue, 60 acres at McDowell Road and 59th Avenue, and the remaining 36 acres of the Baxter Tract. Each site would be made up of “units” consisting of 15 to 25 multi-family grouping of houses, each sharing common barns, poultry houses, milk sheds and community buildings. The Chandler Unit of Arizona Part Time Farms was incorporated separately in July 1937, as Chandler Farms, Inc. However, the project and the structures built for it no longer exist. As each subdivision was built and occupied, the Resettlement Administration provided for the creation of ‘farm associations.’ The concept was to allow members of the association to sell their ‘spare time’ labor at prevailing farm wages to the association to offset the cost of living on the project. Profits were to be divided equally among residents. The Phoenix Homesteads Association was incorporated in August 1936, replacing Rural Homes of Arizona as administrator of the Baxter Tract. Each resident was required to join the association and by March 1937, both phases of the Baxter Tract were assimilated into the Association. By 1939, virtually all residents of the Phoenix Homesteads project worked at full-time jobs and were unable to give much time to cooperative labor efforts, although they did tend their home gardens after work and on weekends. This situation forced the Association to begin hiring full-time farm laborers to tend the dairy herd and poultry operations. This movement away from the initial concept of a cooperative farm effort toward a more commercial enterprise forced the federal government to recognize these particular resettlement projects as separate entities from the typical part-time farm project. Consequently, federal administration of resettlement projects whose residents were deriving their primary income from non-farm employment was transferred to the Federal Public Housing Authority. In 1944, an act allowing farm associations to repay the purchase price of housing sold by the Resettlement Administration was passed. 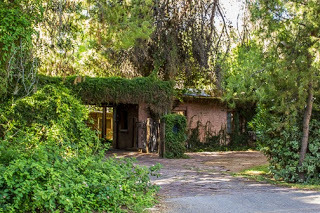 By 1948, the Phoenix Homestead Association had paid the indebtedness in full to the United States, which released all interest the government had in the property. 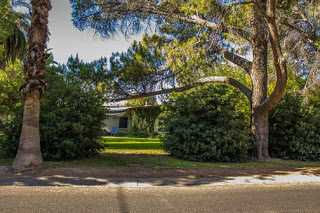 Although the first phase was designed and developed locally, the second phase of the Phoenix Homesteads community was designed by engineers and architects employed by the Resettlement Administration. Hence, the architectural styles of tract 2 are representative of more uniform public housing which was designed to emphasize economy, uniform house plans, efficient heating and cooling, and use of low-cost local construction materials. Like the houses in the initial phase, homes in the Arizona Part-Time Farm tract are principally constructed of adobe. The Great Depression and the associated New Deal programs had a significant effect on the development of Phoenix. The Phoenix Homesteads District survives today as a tangible link with this important early influence. 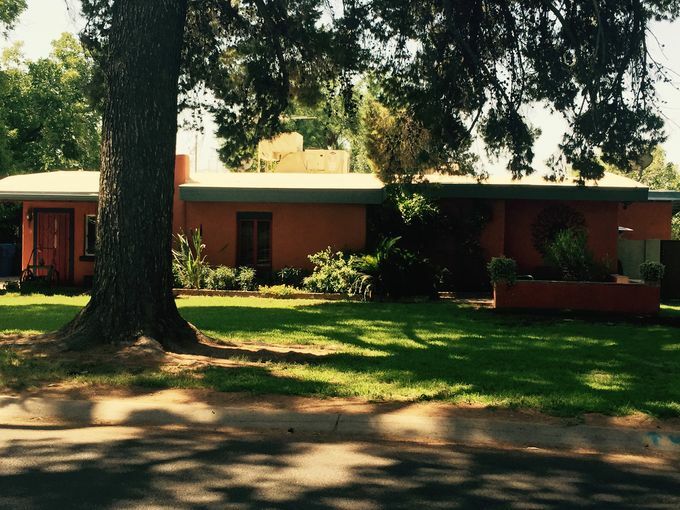 Of the original 60 homes built in the two phases of the project, only 45 or less remain and are excellent examples of adobe construction. 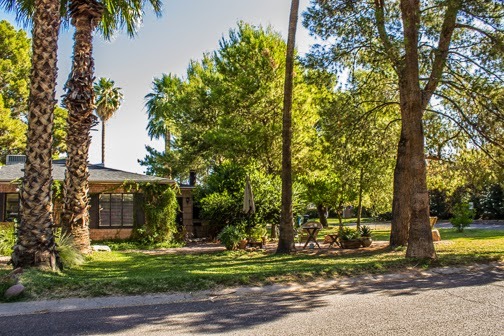 The Phoenix Homesteads Association continues to operate today, making it the oldest continuously operating homeowners association in the Valley. 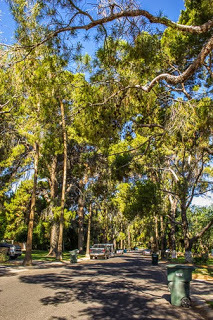 Many aspects of its heritage remain, including the large lots, the towering Aleppo Pines and Washington Palms, and common area, which give the district a decidedly rural character and make it one of Phoenix’s most unique neighborhoods.